If Cuomo’s budget funds CUNY at $1.6 billion, why does the state budget website list the governor’s funding for his CUNY budget at $1.2 billion? Why does page 45 of the governor’s executive budget include a $470 million reduction of state spending on CUNY’s senior colleges? Why does the governor’s budget briefing book explain, in the mealy-mouthed and obfuscatory language of all bureaucratic evil, “General Fund savings in the Executive Budget are expected from [realigning] financial responsibility for City of New York Senior Colleges”? One answer to these questions might be that while the governor intended to cut state funding for CUNY schools, the blowback has persuaded him to change his mind, at least for this budget cycle. But that’s not what [Cuomo’s director of state operations Jim] Malatras is saying. His astounding claim is that Cuomo has always maintained level state funding for CUNY in this year’s budget process. The balls of this statement, flying in the face of heaps of documentary evidence and the past two months we’ve all just lived through, are stupendous. Cuomo and Malatras are effectively staring New Yorkers right in the face and telling them that Oceania has always been at war with Eastasia. 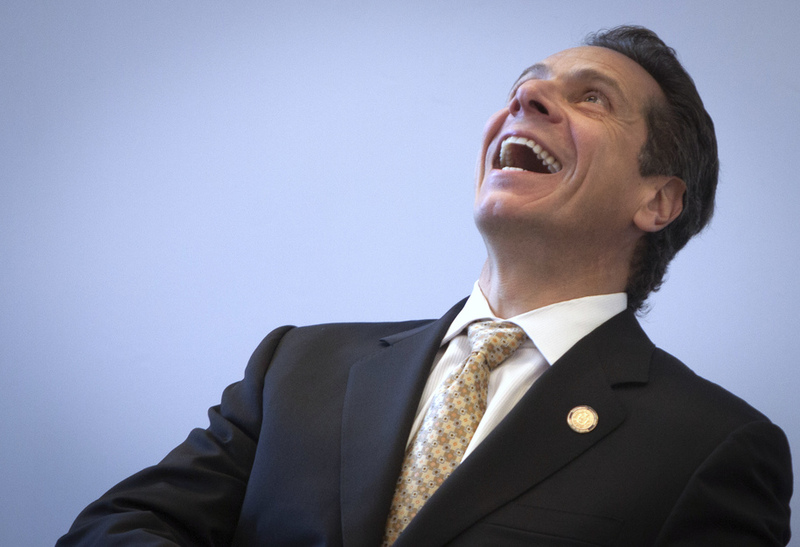 Are you gonna believe Cuomo’s spin operation or your own lyin’ eyes? This is beyond the forked tongue we expect. It’s cephalopodic! Last week the Republican-dominated state senate took the governor’s plan to slash state funding for CUNY and ran with it, justifying Cuomo’s proposed hatchetry with a rationale of its own: CUNY must be punished with budget cuts, senators claimed, because the City University once described as the Jewish Harvard is anti-Semitic. Cuomo’s erraticism and the rank BDS smear–the latter as flippant about destroying a university system of 480,000 students across 23 colleges as Israel the Gaza Strip–instantiate a collapse in the neoliberal imagination. Donald Trump this year embodies that, of course, if by dint of the failure of his establishment rivals, but we see it in Hillary Clinton too. Clinton’s speech to the American Israel Public Affairs Committee earlier this week was warmongering red meat for the hard right: Iran and nuclear weapons, defeating an ISIS the U.S.’s war in Iraq helped create, Hezbollah and Hamas which dare defend Lebanon and Gaza, connecting–again–a BDS campaign supported by many Jewish organizations to anti-Semitism, ‘peace’ talks on Israel’s terms alone without the U.N., mourning Israeli victims of the conflict but not a word about the orders more Palestinians killed by indiscriminate carpet bombing during Operation Protective Edge. Not a word about land and water expropriation. Not a word the Israeli democracy Clinton celebrated is no such thing, as Max Blumenthal details at length. And then, suddenly, not a glimmer of self-consciousness asking supporters of an apartheid state–gilding the iron fist–to speak up against discrimination and violence. Across the board, from local municipalities up to the world stage, the class character of the state, while always present, is beginning to emerge crystal clear. Illusions to the contrary can’t be kept in place. Political reps are being drawn-and-quartered by the demands they convince the greater population that the expectations of the 0.1%, between and within societies, must be met at any and all costs for the greater good. People suffering from schizophrenia may hear ‘voices’ – auditory hallucinations – differently depending on their cultural context, according to new Stanford research. The striking difference was that while many of the African and Indian subjects registered predominantly positive experiences with their voices, not one American did. Rather, the U.S. subjects were more likely to report experiences as violent and hateful – and evidence of a sick condition. Europeans and Americans tend to see themselves as individuals motivated by a sense of self identity, whereas outside the West, people imagine the mind and self interwoven with others and defined through relationships. Human consciousness and emotions, unlike those of most animals, are strongly, if not uniquely, synergistic with the rich dual heritage system of embedding culture. This suggests, in addition to more complex failure modes, a culturally dictated plasticity may have enabled us to readily adapt to changing circumstances and the vicissitudes of socioecological chance. Indeed, exaptation of basic animal consciousness –phenomenal, access, or otherwise–to such a synergism may well constitute the unique late hominid advantage that has enabled small, highly disciplined bands to become the most fearsome predators on the planet. The synergism may come at a cost. Some of the most common psychopathologies may arise at evolutionary-developmental interfaces, where consciousness’ historical sources–phylogenetic innovation, exaptation, cultural heritages–have the most difficulty developmentally meshing even in the healthiest among us. The paradigm has implications for patient care and offers a testable alternative to mismatch theories of psychological disorder caught in Pleistocene amber. Treatment protocols should assimilate the impact of the events and conditions the diaspora of human populations has endured the past 10,000 years and, in many cases, continues to endure, a perspective not unlike those of Fanon and Memmi. We needn’t diagnose Cuomo (or any other politician) personally, for even Caligula’s madness represented as much the Roman Empire itself as familial instabilities or the poison of palace intrigue. One is reminded of Joseph Campbell’s riff on Oswald Sprengler to the effect that heroes, or in this case our villainous leaders, incarnate the epochal process. Even the better integrated among them can founder, arms flailing, caught within the metaphysical vortex around which they organize their power. is that it prevents the self-righteous from seeing that what they consider morally self-evident is informed by self-interest. The self-interest of German export industries, for example, underlies Germany’s identification of the ‘European idea’ with the single European currency. The problem is exacerbated by the fact that the national interest that is mistakenly seen as identical to the interest of all reasonable human beings, in Europe and beyond, is necessarily shaped by the political interest of the government and its dominant social bloc in preserving their power. This puts peripheral countries at the mercy of the national power games and the moral and semantic ethnocentrisms of countries at the centre, which are hard to decipher for outsiders – especially with a postmodern leader like Merkel who, free from substantive commitments and constitutional constraints, has perfected the art of staying in power by means of unpredictable changes of course. Greece was thus a mere conduit for a bailout. It was not a recipient in any significant way, despite what is constantly repeated in the media. Of the roughly 230 billion euro disbursed to Greece, it is estimated that only 27 billion went toward keeping the Greek state running. Indeed, by 2013 Greece was running a surplus and did not need such financing. Accordingly, 65 percent of the loans to Greece went straight through Greece to core banks for interest payments, maturing debt, and for domestic bank recapitalization demanded by the lenders. Contrary to the Syriza capitulation that followed, our choices are never merely down to throwing in with such an order 1) consciously or 2) not. However fascinated I am by the extent to which many instinctively identify with–-in the sense of role-playing–-politicians who work expressly in the interests of capital few actually own, there are always alternate modes of interpretation. The Paris Commune, on which we pinned our previous post, is a radical favorite because, unlike Blyth’s piece, an alternate interpretation led to reversals in fortune for nearly two million people in a matter of days. The working class did not expect miracles from the Commune. They have no ready-made utopias to introduce par decret du peuple. They know that in order to work out their own emancipation, and along with it that higher form to which present society is irresistibly tending by its own economical agencies, they will have to pass through long struggles, through a series of historic processes, transforming circumstances and men. They have no ideals to realize, but to set free the elements of the new society with which old collapsing bourgeois society itself is pregnant. In the full consciousness of their historic mission, and with the heroic resolve to act up to it, the working class can afford to smile at the coarse invective of the gentlemen’s gentlemen with the pen and inkhorn, and at the didactic patronage of well-wishing bourgeois-doctrinaires, pouring forth their ignorant platitudes and sectarian crotchets in the oracular tone of scientific infallibility. Nothing is inevitable in any direction, of course, but such reversals, as rare as they may be, however they may be crushed soon after, tell us the capitalist ethos, whose propaganda must be hammered home on a daily basis, is no natural order. The elite class may be arriving at the same conclusion one dyscontrol outburst after another. This entry was posted on March 24, 2016 at 9:28 pm and is filed under Revolution with tags Andrew Cuomo, Angela Merkel, BDS, budget cuts, Caligula, CUNY, Greece, Hillary Clinton, Israel, Joseph Campbell, Karl Marx, Marky Blyth, Max Blumenthal, New York, Nick Pinto, Oswald Sprengler, Paris Commune, Wolfgang Streeck. You can follow any responses to this entry through the RSS 2.0 feed. You can leave a response, or trackback from your own site.